Welcome to Green Haven Holidays. We look forward to seeing you. Please feel free to use the enquiry link to request bookings for camping or for the holiday cottage; or you can email (info@greenhavensuffolkholidays.co.uk) or telephone us (07769 648617). Green Haven is the perfect place to enjoy a low environmental impact holiday in the Suffolk countryside. 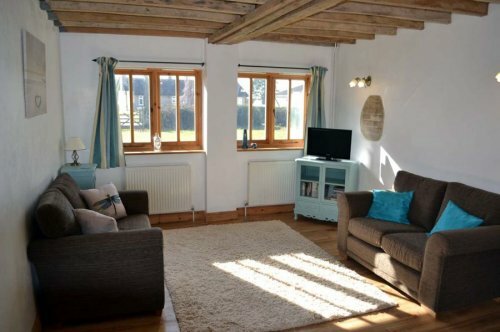 Situated in the quiet, friendly village of Rumburgh; we are just 20 minutes from Suffolk’s stunning Heritage coastline, an area of outstanding natural beauty; close to the lovely seaside towns of Southwold and Walberswick and the RSPB nature reserve at Minsmere; in a tranquil, rural setting, surrounded by fields. Also nearby are a number of traditional market towns and villages and we are within easy reach of Norwich and The Broads. At Green Haven Holidays, we aim to ensure our guests have a relaxing holiday in a peaceful and friendly setting. Attached to our house is the refurbished Wheelwright’s Cottage, once the village wheelwright’s workshop, now a one bedroom, characterful holiday cottage. We also have our small eco-campsite - up and running since May 2014. Click Camping at Green Haven to find out more about what is provided and how to book. We have space for 5 caravans or motor homes and up to 10 tents - with electric hook-ups available. The camping field is in a beautiful and peaceful location, surrounded by trees, hedges and fields. All visitors are welcome to visit our reception area, to purchase local produce, hire fire baskets or to find out about what to do, where to eat and where to go in the area. We continue to develop and run as sustainably as possible. In the future we hope to provide additional accomodation on the campsite - this might be tents for rent or safari tents. With any decision we make we try to follow our principles of Green Haven being as green as we can make it. Green Haven is the ideal place to unwind and get away from it all for a holiday or short break. We are a small and friendly, family-run business, which focuses on appreciating the environment, countryside and local resources around us - using them sustainably and sensitively. Doing your bit locally makes a difference globally. We hope you’ll come and visit us. 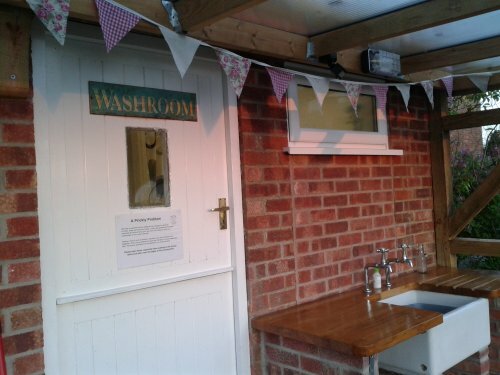 The shower block and washing up area. The characterful holiday cottage - Wheelwrights. Originally designed by Green Haven and Blythweb Ltd. Originally Hosted by Blythweb Ltd 2012 - 2016.